WARNING: ALWAYS verify that one theme is appropriate for your version of Windows. For example, you should NEVER use a theme intended for Windows 10 version 10586 on Windows 10 Creators 1709. Note: The version you are using can be found by searching "winver" when pressing "Windows Key" + "R"
Warning: Don't use Theme and Icon of Windows 10 April 2018 Update 1803 for Windows 10 October 2018 Update 1809. Please wait me a bit time. 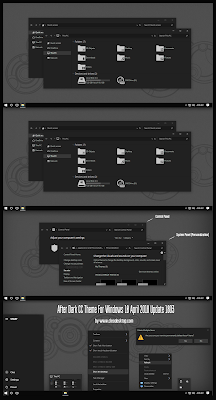 I will update theme for Win10 October 2018 Update 1809 and send it for you. Support: If you like my work, please consider buying a theme [here]. Note: Please use 7zip for extract [link]. - Copy all file in "Theme" folder to "%windir%/Resources/Themes". - Open personalize panel and apply theme. "Please pay for Donate if you like theme"
I am a graphic designer, content creator and developer. I've focused a lot of my time on creating themes for Windows 10. I strive to create beauty in all my projects. I try to create content that looks simple, clean and great; content that is beautiful, functional & usable, without looking really cluttered; the line between minimalist form and maximum beauty, without being garishly excessive, or austere and pretentious. Simple beauty is something that should be gorgeous, and still accessible & affordable to all people, not something reserved only for the rich. I think I've achieved these goals in my work, and my approach to design. Below is a gallery of some of my work. If you like what you see then recommend the site to your friends. Thank you!